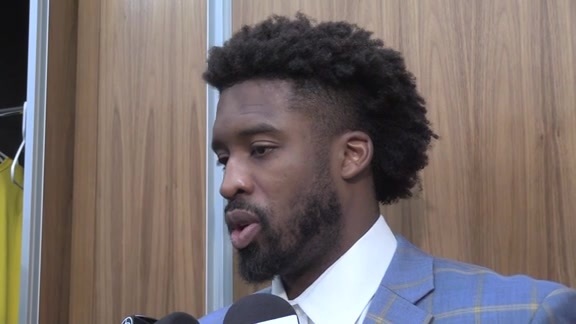 February 11, 2019: Wesley Matthews hits a deep three to beat the shot clock and record his first field goal as a member of the Indiana Pacers. 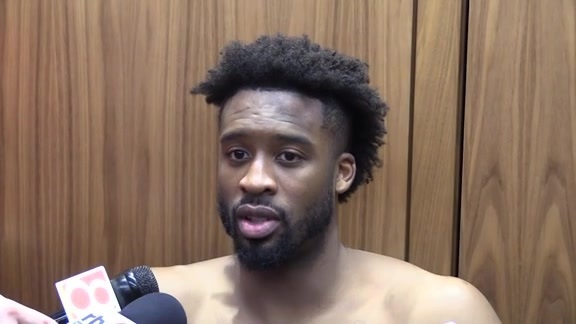 February 11, 2019 - Pacers players Myles Turner, Darren Collison, and Wesley Matthews discussed Indiana's 99-90 win over the Charlotte Hornets on Monday night at Bankers Life Fieldhouse, as well as how Matthews performed in his Pacers debut. 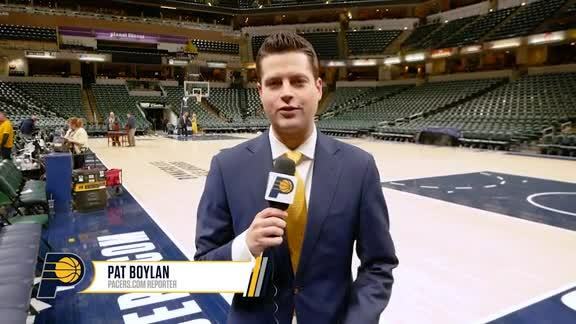 February 9, 2019 - Pacers.com's Zain Pyarali breaks down the Pacers' sixth straight victory, as Indiana delivered another impressive defensive performance paired with a couple of timely fourth quarter 3-pointers by Wesley Matthews in his Pacers debut. 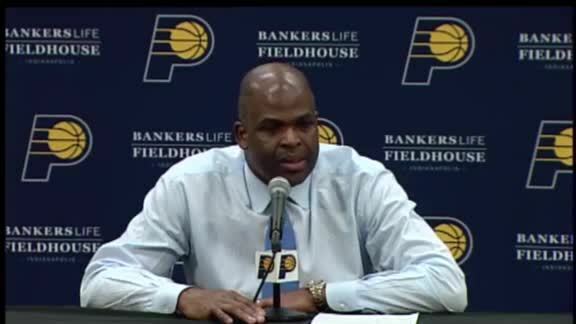 Feb. 11, 2019 - Pacers head coach Nate McMillan speaks with the media following Indiana's 99-90 win over the Charlotte Hornets at Bankers Life Fieldhouse. February 11, 2019: Domantas Sabonis feeds Doug McDermott on the backdoor cut, and McDermott slams it home. February 11, 2019: Domantas Sabonis goes unguarded down the lane for the dunk. February 11, 2019: Myles Turner spins away from the defender and drains the post jumper. February 11, 2019: Darren Collison bounces a beautiful baseline pass to Cory Joseph, who finishes with the reverse layup. February 11, 2019: Domantas Sabonis gets loose on the pick-and-roll and throws it down with one hand. February 11, 2019: Wesley Matthews assists Myles Turner's 3-pointer. February 11, 2019: Darren Collison shakes free off the dribble and hits the stepback jumper. A team knows it has something special going when a former Rookie of the Year who had started 78 percent of his games before this season is actually pleased to go back to playing off the bench. Just as it knows it has something special going when a new player trying to ease his way into the starting lineup is told he needs to shoot more. 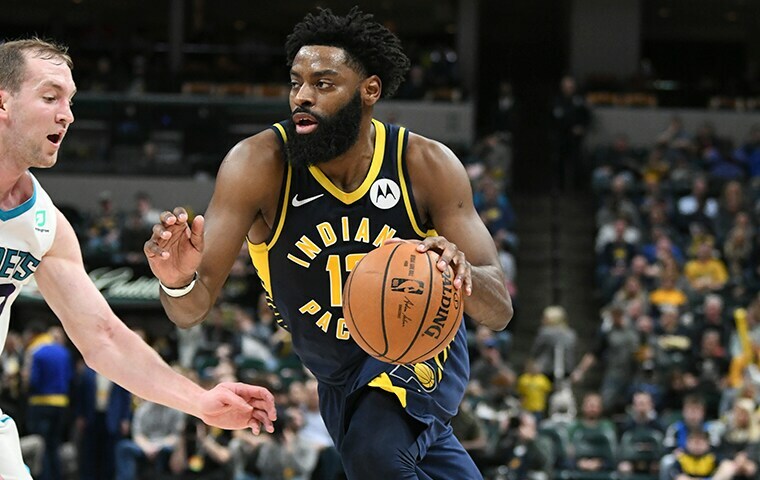 Tyreke Evans stepped aside for Wesley Matthews Jr. to join the Pacers' starting lineup Monday, returning to the reserve unit he had enlisted to join last summer so that Matthews could begin the acclimation process that will be crucial to the outcome of the Pacers' season. It turned out well in a 99-90 victory over Charlotte that ran the Pacers' win streak to six games, even if Matthews was clearly dealing with the bad combination of rust and growing pains. He hit just 2-of-10 shots, but the two makes were important and the eight misses didn't seem to bother anyone in the locker room. Matthews is a 32-year-old veteran of 10 NBA seasons, so his history speaks louder than current events. And it's long been in the books that he's a good perimeter shooter and a standout defender who has a variety of skills and the mentality to take advantage of them. Earlier Monday, Victor Oladipo spoke with the media for the first time since his season-ending knee injury. He expressed optimism for his own full recovery and for his teammates' hopes for recovering from his absence. The addition of Matthews, who signed a contract on Sunday and had a couple of walk-through workouts to learn some of the offense before suiting up against the Hornets, enhances the legitimacy of Oladipo's confidence. The words "perfect fit" echoed throughout the locker room after the victory from the likes of Thaddeus Young, Myles Turner, and Darren Collison, and while Matthews' stat line didn't support such high praise, his performance revealed the potential for its accuracy. His effort on defense and his good intentions on offense were unmistakable. He even hit a couple of important 3-pointers in the fourth quarter, when the Pacers broke open a game that had grown unnecessarily close in the third period. "We obviously miss Vic, but Wes is able to step in right away and have an impact because of the things he does," said Turner, who led the Pacers with 18 points and padded his league-leading blocked shots average with three. "He's not a guy who has to shoot the ball 20 or 30 times a game. He's not a guy who demands shots, a guy who's going to complain. He comes in with a businesslike mentality, he takes care of things on the defensive end of the floor and he hits shots. So he fits in right away." Well, not exactly right away. Matthews missed his first six shots while trying to get comfortable amid several in-game tutorials from teammates and coaches. His first made shot was significant, though, a 28-foot 3-pointer with 3:57 left that opened a 10-point lead. He added another, from 29 feet with the shot clock running down, for a 12-point lead with 2:15 remaining. As an added bonus, Matthews picked up a technical foul midway through the third quarter for loudly and dramatically protesting a foul call. "I just had to let the people of Indiana know I cared about this game," he said. Whatever amount of confusion he's feeling in the offense is forgivable. Twelve days earlier he had played his final game for Dallas, scoring 17 points while hitting 5-of-9 3-pointers. Six days earlier he had played the last of his two games with New York, scoring nine points on 2-of-11 shooting. 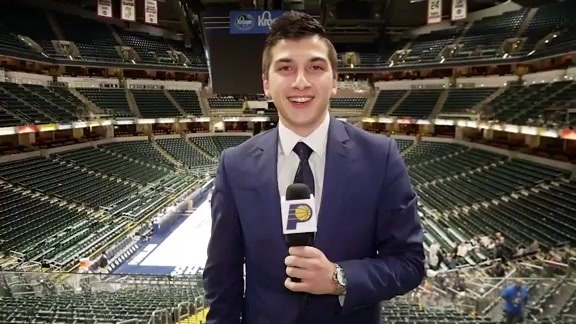 One day earlier he had met his Pacers teammates and gone through another offense, although he had been mailed video to review before the acquisition became official. "It's three different game styles between Dallas, New York, and here," he said. "That's for sure. You've got to have the 'Men in Black' erase button where you just forget everything else and try to hone in on what's most important, and the tendencies and the reads, and then in your own way play basketball. "I think it went well. These guys were confident in me early." Matthews admitted to nerves and to not wanting to appear selfish, but the only complaint he heard during the game was for passing up shots. "We were telling him, 'Shoot!'" Turner said. "He was trying too hard to fit in and get guys going. He's got to be himself. He's going to be aggressive the rest of the season, there's no doubt in my mind." Pacers coach Nate McMillan revealed after the game Matthews had been promised a starting position as a prerequisite for signing with the Pacers, and rejecting the offers from San Antonio, Philadelphia, and Oklahoma City among others. McMillan was comfortable with such a guarantee because of Matthews' track record and the puzzle-solving impact it had on the overall roster. "Having Wesley in that role of starting puts everybody back in their place," McMillan said. Namely, it puts Evans back with the reserves and takes the unproven guards Aaron Holiday and Edmond Sumner out of the rotation. That's how the Pacers began the season and how they intended to finish the season until Oladipo's two injuries interrupted their plans. Evans appeared revitalized by his reassignment. He hit all four shots in the first half, when he led the Pacers with 12 points. He didn't score in the second half but was a crucial contributor to a reserve effort that outscored Charlotte's backups, 35-10. McMillan calls fewer set plays and looks to attack fewer mismatches with the second unit, which enables Evans to play a more free-flowing game that suits his strengths and improves his comfort level. He's particularly effective running pick-and-rolls with Domantas Sabonis, such as the one that resulted in Sabonis' dunk barely more than a minute after Evans entered the game late in the first quarter. "Just turn the corner," Evans said. "When he rolls, it's either a layup for me or a dime for him. It works the majority of the time." "I'm not a bench player, but on this team with these guys it's definitely more comfortable." A lot of comfort can be taken from the six-game winning streak and 38-19 record the Pacers take into Wednesday's game against Milwaukee, which owns the NBA's best record (42-14). They'll need to acquire more of it in the challenging months ahead, but at least now all the parts have been ordered and installed.